This week the weather was the reverse of the previous session. Once the sun was low the cold northerly wind kicked in making it borderline as whether we should open up the hives as very few bees were flying. Disappointingly it looks like in marking the queen in colony 5 last week we injured her and the colony had drawn out and nearly capped a large queen cell. Colony 5 and her sister colonies 3 and 4 has always been very calm and well behaved, but with the cold air and a new queen cell the colony became very touchy, so we closed the box up and will leave it for three weeks to allow the queen to emerge, mate and start laying. Even colony 7 was a bit aggressive during the inspection, disappointedly the colony had not increased since the previous week, again this could have been down to the weather. The steam train of colony 2 trundles on, we took another nucleus from the colony and created colony 8. Next week we will check that there are queen cells. The BBKA Basic exam is on 3rd July and we need to have 5 queen right colonies for then, with the demise of 5 we have 4 such colonies, next week we open colonies 1 and 6 following their artificial swarms three weeks ago so let’s hope they are queen right. Although it had been raining on and off most of the day the weather improved dramatically for our session. We opened upon colonies 3 and 5 for the first time in 3 weeks to check that we had a laying queen in each. Colony 3 had all stages of brood whilst colony did not have sealed brood. We moved colony 3 into a full size box and marked the queen in colony 5. Colonies 2 and 7 were inspected and their floors replaced with mesh floors, 2 is still romping away with the brood box filling and another super was added (making it three in total). Colony 6 has grown to 6 frames of brood and is very calm. We also looked at nucleus of a drone laying queen (even pattern and only drone brood), it is quite hard to spot first off as the brood is all even. We continued to enjoy good weather in the last two sessions, the focus of these two sessions was to perform Artificial Swarms on hives 2 and 7. Hive 2 has been extremely productive with the brood chamber full of brood, this colony was moved to one side and sited on stand 1, the frame with the queen and two more frames of brood were transferred to a new hive sited on the original stand. The queen took some finding, at least three trawls through the colony. The stores in two supers was split between the colonies. The two colonies were checked on 3rd June, the “swarm” has at least one capped queen cell, however no eggs were seen in the queen right colony which is a concern. The procedure on hive 7 moved only the frame with the queen on, it took a good amount of time to find eggs on the “swarm” colony which may have chilled the brood. Examination of the swarm (now hive 6) on 3rd June revealed many perforated caps plus the queen cells were poor and of an emergency nature. Meanwhile the old queen (red) in hive 7 seems to be enjoying a new lease of life with the fresh foundation and is reported to be increasing well. 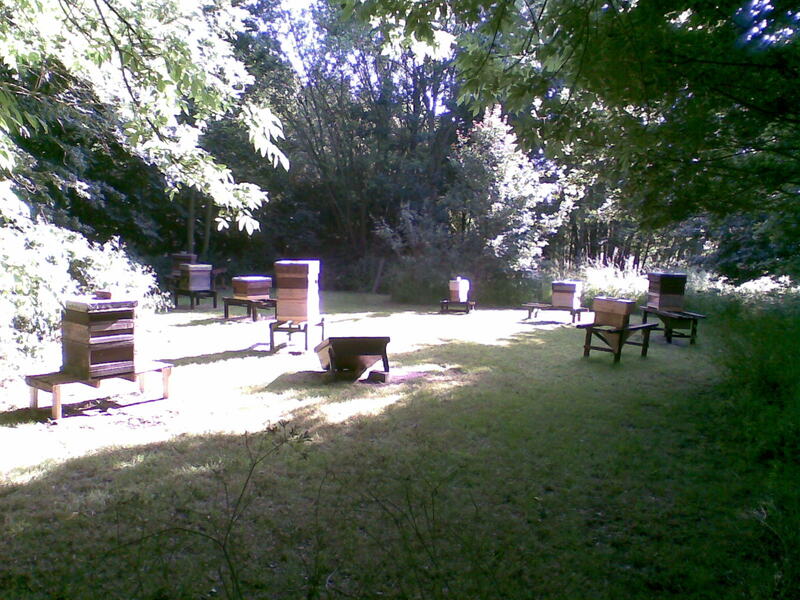 Hives 1 and 6 will now not be examined until 17th June at the earliest. Looking at the forecast for this coming Wednesday it looks like we may well miss the showers, let’s hope so as there is much work to be done at this crucial time of the season. You are currently browsing the Mid Bucks Beekeepers Association Blog blog archives for June, 2010.